There are thankfully no multi color or ‘colorless’ non-artifact cards in this set to go over. That means once black is finished, we’ll be half way through the series (with only Red, Green, and Artifact/Lands left). 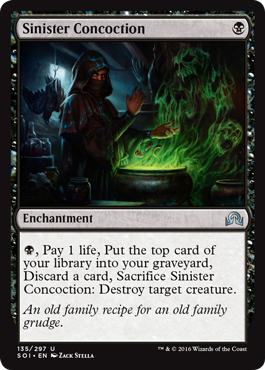 Black usually has the best removal spells, some kind of graveyard mechanic, and some deadly creatures, but in this set it seems more like Wizards put these things together. Deadly creatures with a graveyard mechanic, a graveyard mechanic with removal, or creatures made deadlier with some kind of built in removal (like deathtouch). I found it hard to choose which to feature and which not to because there is a large amount of playable black cards in this set on one level or another. They’re not all powerful, but in some situations they can be. Lets start off like we always do though, with removal and then go from there. Straight out kill spells at common or uncommon are getting harder and harder to find. Throttle was just reprinted in a recent set, but it’s back again. Want to know what’s sad? 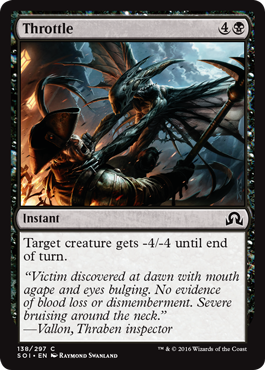 This is probably the BEST removal black is going to get in this set. A 5 mana instant that kills a 4 toughness or less creature. We usually depend on black to have answers to deadly threats, but this time that’s not the case. Throttle is alright, but not what you want when you’re facing down a 9/7 indestructible land or a 7/8 kraken. The card will take out about 70% of your opponent’s creatures, but you better have something better if you want to take out that bomb rare coming your way. Throttle is serviceable but not first pick material I think. I’d be focusing more on white spells to exile/destroy things. Okay, so you can kill any creature if you want but you have to jump through an insane number of hoops to do so. You lose a life, lose card advantage, give yourself one card less to draw from your library, and this is all after you’ve played the card already which means your opponent can play around it. I know Wizards wanted to make it more difficult to cast unconditional removal, but this is insane. I guess it’s good in delirium decks, but in most of the other types of decks you’d use it in it will put you at a disadvantage. You’re basically 3 for 1-ing yourself to kill a creature, but hey, it kills anything. I never thought I’d say that I like this type of effect, but seeing what other choices we have in black, I have no choice but to go with Murderous Compulsion. Your opponent can play around it if they know you have it, but luckily both white and blue have effects that tap down creatures. If you grab a few tapping effects be sure to grab this in draft, and vice versa if you draft this. You’ll have to use 2 cards to kill a creature sometimes, but it’s better than nothing. 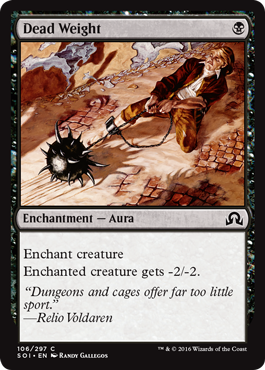 Half of the time you should be able to use it to kill a creature you want to, and if I read the rules right you might be able to use it at instant speed if you use its madness cost after casting a card like Catalog. I’d take this over Sinister Concoction I think. 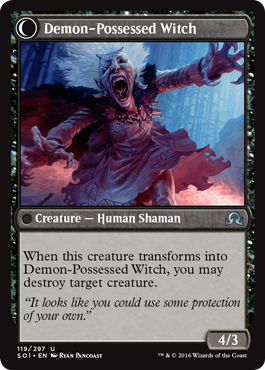 Thankfully Dead Weight is back in Shadows Over Innistrad. I was beginning to lose hope but Dead Weight is a decent removal spell, even if it’s an aura. It’s both cheap and efficient, and does a good job of getting rid of a variety of aggressive, early creatures. There are more humans, spirits, vampires, and wolves with 2 toughness than you think. Even if you can’t straight out kill a creature, you can essentially neuter one by reducing its power to almost nothing. It’s also nice that it’s an enchantment because that helps add to delirium triggers. It’s a solid choice for black removal in draft, but if possible I’d try for some brightly flaming burn or exiling white card first. If you’re stuck playing black it’s not bad though. It should come in handy. I like it cause it’s cheap and straightforward to use. Sadly that’s all the removal spells we have, but we do have effects that act like removal of sorts. 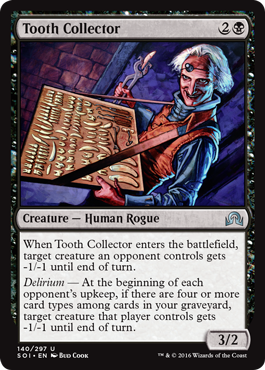 Besides having one of the creepiest pictures in the set, Tooth Collector is a rather strong card. It’s a 3/2 for 3 mana that kills a token or glass cannon creature like Stitchwing Skaab, and if you can activate delirium you can literally stop your opponent from playing any tokens or fodder for the rest of the game. It’s more of a defensive ability however, as it happens on your opponent’s turn. If it doesn’t stop them from attacking with their best creature, it should at least put them in a tricky situation. Dead Weight works well with Collector, as well as Throttle. He makes both of those cards more effective, while also having a decent body that can trade with quite a few creatures. I’d take him somewhat high in draft. She looks like a sweet old granny, but Kindly Stranger is a murderous witch that kills anybody that gets too close to her. If you needed any reason to play a delirium deck, it’s her. She’s a great 3 drop that becomes a 4 power beater and also kills one of your opponent’s creatures. Play those cards with discard or sacrifice abilities so you can use her at you leisure. I’d go as far as to say you should splash Kindly Stranger in a 2 color deck because this effect is just incredibly strong in this format, especially when it’s on top of a 4/3 creature. I’d feel hard pressed to pass this card up as my first pick in draft. Grab as many as you can get and focus on a way to get delirium quickly with cards like Bound by Moonsilver. Seems really good in BW humans. I absolutely love this card. It’s so diabolical and unfair. 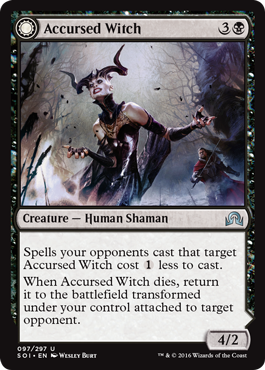 The witch is a glass cannon creature to be sure, but she puts your opponent in a damned if you do damned if you don’t situation. They can take 4 damage a turn (which is a decent chunk of life), or they can block it and start down a cursed path that drains them of life each turn while making your late game shenanigans easier to cast. What would have made it better was if it made the spells that target your opponent’s CREATURES cheaper, but nope, it’s on ones that target a player. This makes it best in a BR deck alongside cards like Fiery Temper and Burn from Within, as well as a number of other black cards that have various effects such as life drain or hand disruption. It also wouldn’t be bad in a “slow burn” UB control deck that uses life drain and tempo to win the game. 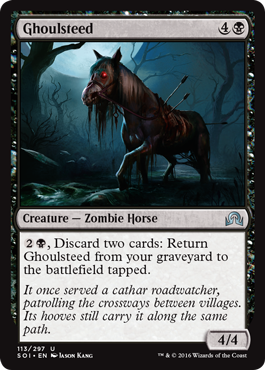 Speaking of Delirium enablers, Ghoulsteed does that job rather well. It’s a 4/4 vanilla creature for 5 mana which is playable, but if it dies you can bring it back indefinitely until you run out of cards. This works well in both Delirium and madness strategies (well, more so with madness). Toss a land and play a madness cost, put him back into play. You can’t beat that value. I’d take it early in draft. Heir of Falkenrath is another good card for madness/delirium, and being only 2 mana helps you to activate delirium or cast a madness card incredibly quick. It’s amazing in an aggressive deck, as you can flip her the turn she comes into play so that you can attack with a 3/2 flyer on turn 3. Don’t underestimate her value. Grab as many of these as you can in draft. Very high draft pick, more so if you can build an aggressive vampire deck around her. 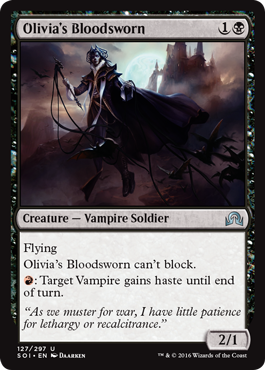 Another decent vampire is Oliviva’s Bloodsworn. It has 2 drawbacks: It can’t block, and it only has one toughness. However, it is able to give itself haste the turn it comes into play (great after turn 2) and it has evasion. I don’t think you’d need too many of these in limited, but it depends on how many vampires you’re able to get your hands on. There are a good amount of playable vampires in Shadows limited, so you should get yourself 1 or 2 for your pool just in case. It’s not great if your opponent has a bunch of spirit tokens, but if your opponent doesn’t have a plan for flyers you can easily win the game with your vampires’ speed. As I said, there are plenty of vampires to go around and even enchantments that make them. 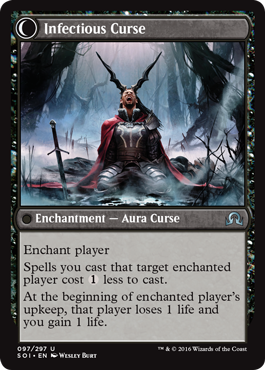 It seems like Shadows over Innistrad has more black enchantments than any other set in recent memory. Call is great if you have a couple of Madness effects to abuse it with, but even if you don’t it’s very useful to have the ability to make a 1/1 lifelink creature each turn. The incremental life gain and additional creatures will go a long in drawn out battles of attrition, and with the right cards they can turn into a force to be reckoned with. He’s somewhat situational, but he can be bonkers in the right deck. If you have an Indulgent Aristocrat, Falkenrath Noble, and Call the Bloodline on turns 1-3 three, you have quite a potent win condition. 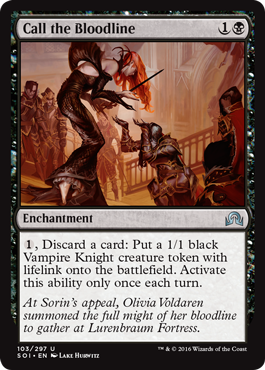 You keep making tokens, sacrificing them to pump your other vampires, and easily overpower your opponent. I think he’ll be better in draft than sealed, but in the right pool Indulgent Aristocrat could be worth playing. Especially worth playing alongside Call the Bloodline, but otherwise I’d say you’d want about 5 other vampires to get some good value out of him. Otherwise, I think a 1/1 lifelinker that can get bigger whenever you sacrifice a creature might slip into that last spot of my sealed deck. Just like the Nearheath Chaplain in white, Ghoulcaller’s Accomplice knows all about value. He’s a bear that makes another bear (a 2/2 creature), or one card that can make two creatures. 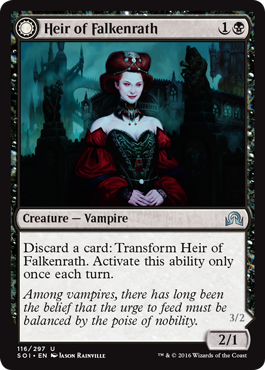 This is the type of card that would be good fodder for the Aristocrat in a vampire deck, or become the backbone of a UB zombie deck. High cost performance, and it’s common which means you should see him often in limited which is also a plus. It’s a great card for your curve and I wouldn’t be ashamed to have 4 of these in my draft deck if I could get them. One of my favorite black commons in the set. Release the Hounds! I don’t think it will be too hard to activate his delirium by turn 5 when you play the hound, and a 5/3 body is rather strong in this limited environment. 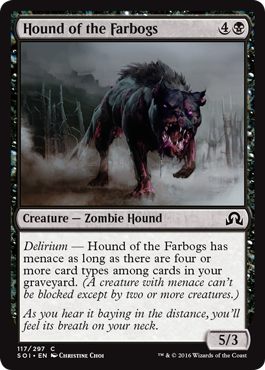 Sure you’ll have to watch out how you attack, but in a BW or BR aggro deck with some combat tricks Hound of the Farbogs will become a force to be reckoned with. Menace is a good way to get your opponent to use more of their resources, and along with a card like Rush of Adrenaline he can deal a lot of damage very quickly while taking out multiple creatures your opponent controls. A good card to have at the top of the curve in a black based deck. Discarding a card for a 2 mana 3/3 seems like a fair trade off, especially with skulk attached. Great card for an aggressive deck, and also works well with madness effects. I’d grab one or two for my deck in draft. Might want to get them somewhat early though. With all of these discard triggers in black, you might want to make sure you’re playing enough clues to draw cards so you have something to discard! Another straightforward card. You get 2 creatures with 4 total power for 4 mana. Good value, made slightly better if you’re casting it for its madness cost. Limited roleplayer in a variety of black decks. Is it worth it? Damn right it’s worth it. 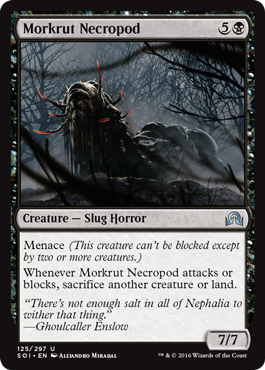 This is a freaking huge card in black, heck, it’s one of the biggest creatures in the entire set! You hopefully won’t have to sacrifice too much once it hits the battlefield, but I’m sure you’ll have no problem getting rid of a land or some other kind of fodder that has outlived its usefulness in order to end the game quickly. Definitely worth splashing for, very high pick in draft. You’ve seen how bad black’s removal is in this set. Outside of white it’s almost impossible to get rid of easily. 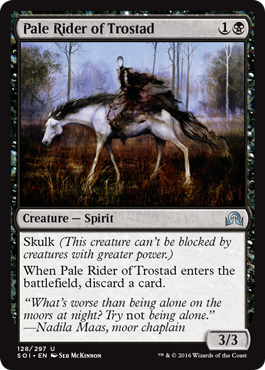 You could block with two creatures and then cast a Throttle on it, but either way getting rid of it is going to put your opponent at a disadvantage. One of the last cards I want to talk about is Liliana’s Indignation. This is one of those all or nothing cards. It’s a card of last resort. If you’re on turn 10 and both are you and opponent are in a stalemate with 10 life left, I say go for broke and cast it for 9 mana to try and hit 5 creatures to finish the other player off. Limited decks are creature heavy as it is, so if you’ve drawn 6-7 of them already there is still a good chance you’ll be able to finish your opponent off with this card (especially if you only have 20 or so cards left in your deck). There is a chance you’ll miss, but there’s also a chance to win big. I’d love to have this card as my alternate win condition against decks where you’re outmatched and overpowered. 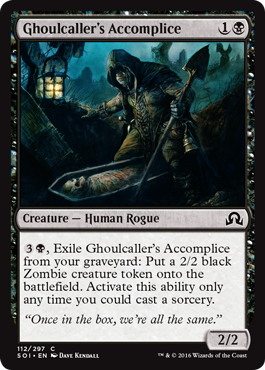 If you still survive the next turn, you could always use some Dauntless Cathars and Ghoulcaller’s Accomplice to put some tokens into play. Fun card. I recommend grabbing at least one for your limited deck. Behind the Scenes – pretty sweet card in a BW deck, and possibly splashed in a white/x deck, but not for all black decks. I like it in BW aggro or flyers. Biting Rain – good card against token and aggro decks that play a lot of 2 toughness creatures. Crow of Dark Tidings – can’t really pass up a flyer in black, but milling yourself twice for 4 cards is harsh. Maybe ok in a delirium deck. Creeping Dread – seems like a fun card to build around. Works with Madness, but doesn’t work if your opponent doesn’t have any cards in their hands. 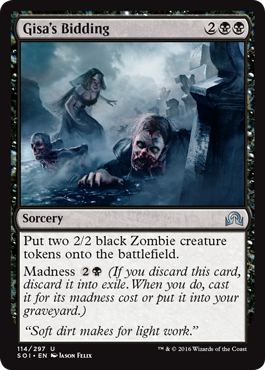 Macabre Waltz – get two cards and cast something with Madness (if you can). Not bad but I’d rather have removal or another creature in this spot. Rancid Rats – with skulk, the lower power the better. Good in a deck that has lots of combat tricks to pump up. Also good on defense. Shamble Back – I expect lots of cards to go in the graveyard, and some of those cards to come BACK from the graveyard. Shamble stops that creature from giving your opponent more value, gives you a 2/2 creature, and gains you two life. Not sure if it’s main deckable though. Sanitarium Skeleton – great card to have for all of those discard effects, also with cards like Indulgent Aristocrat. Should be a roleplay in quite a few black decks. Ashmouth Stallion – this is the biggest “shade” I’ve ever seen. A 3/3 for 4 mana fine and playable, but if you can activate that delirium effect it gets much better. Stromkirk Mentor – another good glass cannon, made even better if you are playing a vampire deck. 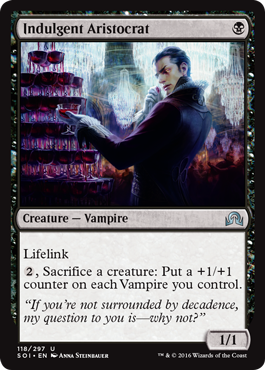 Vampire Noble – good for a vampire deck, serviceable as a 3 drop in most black decks but will most likely be one of the last cards you you add/first you cut from a good deck. Black has some really good creatures this time around. The vampires are especially dangerous. They have some good abilities and are rather aggressive I think. The zombies aren’t bad either. I’m still a little disappointed with the common and uncommon removal spells, as they seem to be better int he support role this time than being the cards you want to first draft in past limited formats. I’m sure once we all get used to delirium and madness effects I’ll be re-evaluating some of these cards differently, but at the moment I’m more or less impressed. I think black will be great as either a support or main color in a deck, and it really adds power to WB, UB, and BR decks. After doing this article I’m going to say that BR and WB are going to be the two best colors combinations in Shadows Over Innistrad limited. I’d also like to note that a lot of these black cards have discard effects so being able to draw cards and keep something in your hand to discard is going to be key. Don’t waste those clues haphazardly! I’m sure there will be some people that disagree with me on a few of these cards, so let me know what you think. I had trouble evaluating some of these cards so if you see something that I should rate up/down let me know. I’ll be busy with work all day on Wednesday, so look for the next article on red sometime on Thursday. Thanks for reading and see you again soon. Indulgent aristocrat feels a bit better than a 3. Otherwise it feels like you are in the correct range. In a vampire heavy pool I’d say he’s closer to a 3.5 rating, but I don’t think he’s good enough to be a 4. He’s too reliant on other creatures to become stronger and can’t do anything by himself.